Today guest blogger on leading feminist blog The F-Word, Nat Newman, explored some of the reasons why expats leave their home countries in the first place. My story is mentioned in the blog – to briefly summarise, I had to leave if I wanted to continue my relationship with my Colombian boyfriend, due to the current immigration policies in operation in the UK. I think understanding why people leave and move to other countries might help others to empathize with the difficulties, challenges and mixed feelings that we expats find ourselves confronted with after the big move. I’ve already had to deal with the whole ‘if you don’t like it here maybe it’s time to go back to your country’ mindset, but.. it’s seldom that simple is it? What if we feel that going back isn’t an option? 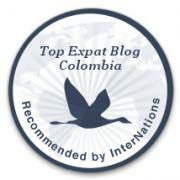 Visit the F-word to read about other expat experiences and reasons for leaving their countries. HowToBogotanos – what was your reason for moving to another country?